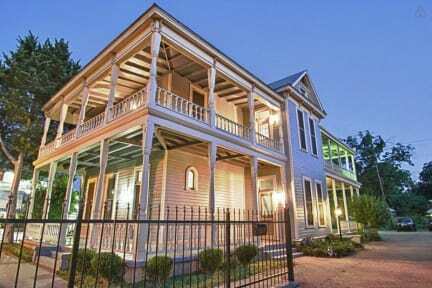 You’ll get a taste of Texas staying in our elegant Victorian mansion, originally constructed in 1892, that is a registered Historic Landmark in the City of Austin. HK Austin features dual wrap around porches, a completely renovated interior, and huge gated backyard complete with cactus, orange trees, peach trees, and more! HK Austin is located in the extremely popular East Side of Austin, within a block of most things people love about Austin -- live music, stiff drinks, BBQ, and plenty of tacos. If you’re looking to paddleboard on the Colorado River or check out Festival Beach Park, that is less than a half mile down the street. Our hostel is one of the only in Austin to feature dedicated parking on-site with a yard that has peach, avocado, and orange trees. We also have 4 different porches all equipped with hammocks, couches, rocking chairs, and more. The perfect place to sit and take in views of the Texas State Capitol and more. Staying at HK Austin is like staying at your longtime Texan friend’s house. We have weekly activities for guests including art night, neighborhood tours, potluck dinners, and more. All our beds feature prime spa quality mattresses with 500 count sheets to make sure your sleep. These beds are some of the most comfortable you'll encounter, and picked exclusively for HK Austin. No guests under the age of 18 and no pets. All guests staying at HK Austin must reside outside of Travis County and have a valid Passport or Government ID. But we are flexible about it, just contact us by email to arrange a different time. Such a warm and welcoming staff. We where treated like family right of the bat and met the most amazing people here. The rooms where nice and had comfortable beds. I will be back without a doubt. A great place to stay, the private room is cosy, and comfortable. Location is nice, right next to plenty of coffee shops, restaurants. I loved my stay at HK. I felt very safe and I loved the beauty of the old house. Not to mention, it was surprisingly spacious. Beds were really comfy and the balcony was awesome! Made some great friends hanging out there. Great location too. It was close to everything without being in downtown. Just wish they would replace the shower curtain, but other than that it was perfect! Stayed here during SXSW. The hostel was flexible about me arriving at 1:30 am and left me the code for the entrance and room. it's a 25 min walk to downtown and I felt safe walking back by myself at 2am in the morning. The price was reasonable even though it is Austin's busiest time of the calendar year. Super nice old house near downtown. The rooms are huge and so the bathroom. The hostel was great- comfy bed, friendly staff and the location was good: walking distance to downtown, and has its own neighbourhood vibe. The only reason my “value for money” rating is midway is because I was there during SXSW, so of course everything is going to be expensive- I guess most of the year it’s a great price :) I would recommend staying here! The house was really nice, though it felt small at times. Very barebones bed, but it's kind of what you'd expect. Though, the website advertises the larger room as 6 bed, but in reality it is 8 bed. Pretty convenient to downtown and 6th st restaurants/bars as well as the airport.